It is estimated that some species of apes will be extinct in as little as 20 years due to illegal hunting, habitat loss, disease and the pet trade industry. Of the six extant non-human great apes, four of the species are endangered and two are considered critically endangered. Additionally, among the 11 subspecies that these six species are comprised of, eight are considered endangered and three are critically endangered. Chimpanzee numbers have declined ~60% in the last 25 years; there are only 700 mountain gorillas remaining; 25% of orangutan habitat in Borneo was converted to palm oil plantations; and fewer than 100 eastern black crested gibbons remain in the wild-making them the world’s most endangered ape. The AZA Ape Taxon Advisory Group developed the Ape TAG Conservation Initiative, to help AZA-accredited facilities contribute to and secure long-term populations of apes in their natural habitats. By working together and leveraging our considerable expertise, influence and resources, AZA-accredited facilities are becoming one of the most important agents of ape conservation. Activities such as anti-poaching patrols and law enforcement, the presence of long-term field sites and researchers, effective protected area management, community involvement, and data collection on population densities and distributions are crucial to the long-term survival of apes in the wild. AZA has made a strong commitment to gorilla conservation in particular by including the taxon in the inaugural list of 10 focal species/taxa for AZA SAFE: Saving Animals From Extinction. AZA SAFE takes a collaborative approach to recognize, promote and bolster conservation efforts for selected species. Efforts are underway to work with experts to determine what actions will be taken to help protect the future of gorillas. 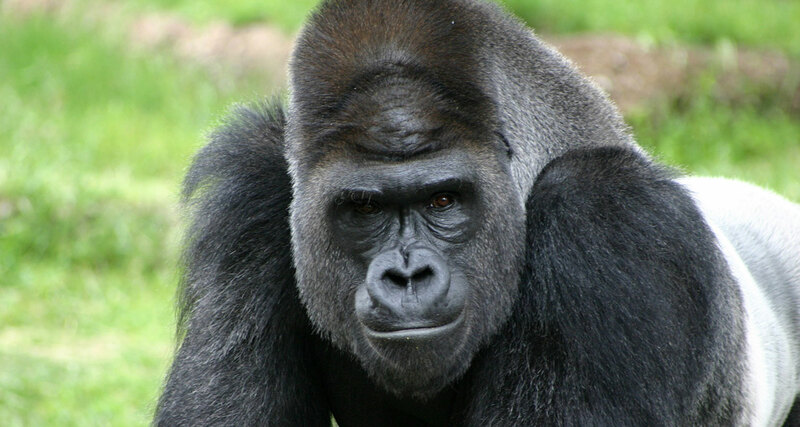 Read more about how AZA SAFE protects gorillas. To highlight this dedication to the survival of gorillas and other great apes, AZA is now a member of the Great Apes Survival Partnership (GRASP), a United Nations Environment Programme dedicated to advancing great ape conservation through political advocacy, habitat protection, and a variety of other avenues. Every year, AZA-accredited zoos and aquariums provide information about their field conservation and science activities to AZA’s Conservation and Research Database. Members enter program updates each year; follow the link and use the search fields to explore how individual AZA-accredited zoos and aquariums are helping apes and other animals. Read more about the AZA community’s commitment to conservation and science. From 1999-2009 AZA, accredited zoos and aquariums, and other partners created, participated in, and supported the Bushmeat Crisis Task Force (BCTF), a coalition of more than 30 major conservation organizations. BCTF focused on building a public, professional, and government constituency aimed at identifying and supporting solutions that effectively responded to the bushmeat crisis in Africa and around the world. Many of the resources it developed are still available, and its influence is still felt in current conservation efforts.